When we talk about the coasts, our mind quickly thinks of beaches, the bright sun, ocean breeze.Yes. The thoughts are very pleasant. However, the word “coast” also brings up images of hurricanes and tsunamis, natural disasters the last few years have become synonymous with. These events have made governments and global institutions around the world sit up and take notice as the frequency of natural disasters increases with humanitarian costs being unfathomable, the destruction unthinkable. Coping with the aftermath is a costly and difficult task and it is these facts that have pushed countries and governments to prepare for disasters and disaster risk management. The Integrated Coastal Zone Management project (ICZMP) recognizes disaster preparedness and risk management as an integral element of integrated coastal management. Through our disaster preparedness trainings, we trained over 600 beneficiaries residing in Kutch, Morbi and Jamnagar located along Gujarat’s coast. 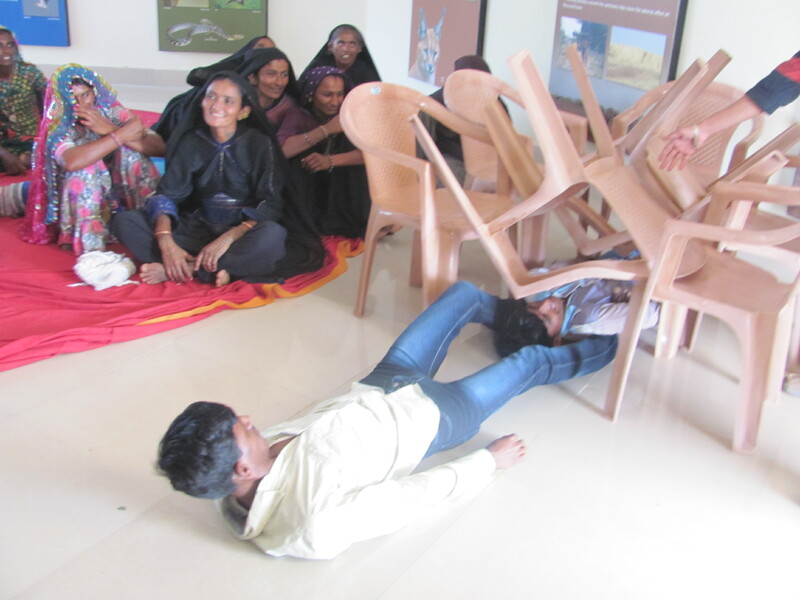 This training was a collaboration between Gujarat Ecology Commission, Marine National Park and Kutch Forest Circle of the Forests and Environment Department, the Gujarat State Disaster Management Authority (GSDMA) and project beneficiaries from village CBOs, Edo-development Committees and SHGs. The training program on Disaster Preparedness for the coastal community included demonstrative trainings on search & rescue, provision of first aid in the event of a natural disaster by trained experts from GSDMA, MNP and the Forest department, Government of Gujarat. It is important to highlight this initiative on International Day for Disaster Reduction (IDDR) 2014 to join the global dialogue on disaster risk management for resilient communities and coasts. Hundreds if not thousands of international organizations, NGOs, individuals, multilateral development agencies celebrated World Sparrow Day all over the globe on March 20th, as they do every year since the genesis of this event. Countless workshops, campaigns, tweets and facebook posts described World Sparrow Day 2014. One must laud the efforts of all these various entities and institutions in promoting an important issue like the conservation of Sparrows which also signifies biodiversity conservation on the whole. However, one needs to seriously reflect on an issue such as this one. A mere click the “Like” or “Retweet” button may spread awareness and show our interest in the issue, but will it solve the problem? It is therefore important to look at the bigger picture, go into its depth and ask ourselves certain questions about the circle of life, nature, its diverse and infinite elements, the questions and concerns that surround them today. Why the sparrow?…why not? Loss of biodiversity is a very significant indicator of the state of our environment, our world and what it means for the future. If a species simply disappears or is less frequently spotted in its usual habitat, this must concern us. The 21st century has realized the fact that use of renewable energy is the most viable deed to sustain depleting natural resources. GEC promotes usage of solar energy in coastal villages of Gujarat and supports the community to integrate the usage of solar energy in daily life. The efforts of GEC have made Mori village of Lakhpat, Kuchchh and Ajad Island of Jamnagar fully solar villages.